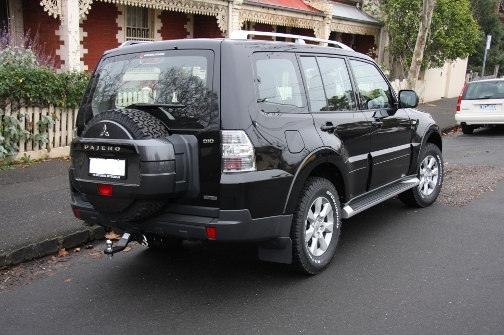 Mitsubishi Pajero has recently won a number of awards including 4×4 of the year in both Overlander and 4×4 Australia magazines. So it was in the shadow of these awards that I decided to put the latest Mitsubishi Pajero GLS to the test. Rather than testing the top of the line models I decided to test the middle of the road GLS. The Mitsubishi Pajero GLS comes with either a 3.2 litre turbo diesel or 3.8 litre V6 engine and in either a manual or automatic . My preference was to drive the 3.2 litre turbo diesel with automatic transmission which with a reported fuel consumption of 9.2 litres per 100 kilometres was preferred over the more thirsty petrol engine at 13.5 litres per 100 kilometres. The diesel engine while not as noisy as the previous model is still audible and is the constant reminder of the fact that you are driving a diesel. The fuel economy that I achieved on my road test was approximately 10 litres per 100 kilometres not bad when considering the size of the Pajero. In terms of safety options, the GLS comes standard with front and side curtain airbags and Mitsubishi All Terrain Technology including Active Stability Control, Active Traction Control, Engine Brake Assist Control, ABS and super select 4WD. Interior quality is of a modern rugged standard with seating for seven (7), power windows throughout, heating and air-conditioning vents to all sets of seats, and ample in car storage receptacles. The sound system is also of a good standard while the trip computer comprises a number of gimmicky options such as barometer and elevation which will rarely be used. Externally the GLS comes with alloy wheels, side steps, roof racks, retractable external mirrors and Yokohama Geolander tyres The standard tyres are essentially road tyres and should you be considering any semi serious 4×4 driving it is strongly recommended that you consider upgrading the tyres to an all terrain option. My preference was BF Goodrich AT. 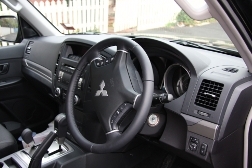 Driving the Pajero is no different than driving a large car, and the higher than normal driving position allows increased visibility where the Pajero comes to the fore is on the open road with its amazing fuel economy and ride handling. The off road capabilities of the Pajero are of a high pedigree with a range of low and high gears available and good clearance which places it ahead of rivals such as Nissan’s Pathfinder and Jeep Grand Cherokee. Mitsubishi has also placed itself ahead of the competition with its standard 5 year full factory warranty, 5 year road side assistance, and most importantly a 10 year drive train warranty. The service interval for the Pajero is 15,000 kilometres or 12 months which is 6 months or 5,000 kilometres longer than its fiercest rivals Toyota Prado and Nissan Pathfinder which means additional money in the pocket of the purchaser. Value for money the Mitsubishi Pajero sits favourably amongst the competition and is significantly less than the comparable Toyota Prado and Nissan Pathfinder. 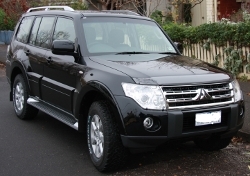 Overall the Mitsubishi Pajero is deserving of its 4×4 of the year titles. © 2019 MyHq. All rights reserved. .